Gelsenkirchen - 21st Birthday boy Julian Draxler saw red as nine-man FC Schalke 04 held ten-man Eintracht Frankfurt to a turbulent 2-2 draw at the Veltins Arena. It was an eventful afternoon for the Germany international, who hadn't long hauled his side level following first-half goals from Alexander Meier, Marco Russ and Maxim Choupo-Moting, before following the already red-carded Kevin-Prince Boateng down the tunnel midway through the second period. Frankfurt's Slobodan Medojevic added his name to the referee's black book late on. Schalke head coach Jen Keller made just one change to the side that drew 1-1 with English Premier League side Chelsea FC in the UEFA Champions League in midweek, with Maxim Choupo-Moting preferred to Sidney Sam in attack. US Timothy Chandler, Meier and Medojevic made their first starts of the season for Frankfurt, while Stefan Aigner returned to the bench following shoulder surgery. The Royal Blues enjoyed far more of the ball early on, but it was the travelling Frankfurt contingent who were celebrating in the 15th minute as Meier squeezed home from close range after Ralf Fährmann failed to deal with Constant Djakpa's inviting back-post cross. Chandler seized on another bout of Schalke hesitancy moments later, the US international's 30-yard strike sailing narrowly over the crossbar. The hosts were looking increasingly rattled and when Boateng mistimed his challenge on Russ, the roaming Eagle took full advantage with a bulldozing run and exquisite outside-of-the-boot finish. Schalke's Max Meyer wasted a glorious opening with half-an-hour gone, but Choupo-Moting made no mistake ten minutes later, his Antonin Panenka-inspired penalty reducing the arrears after Medojevic was adjudged to have handled Draxler's low cross. Other than that slip, Thomas Schaaf's men had done a pretty decent job of keeping Schalke at bay, but that soon changed five minutes into the second half. Choupo-Moting was allowed all the time in the world to whip in a ball from the right-hand side, with Draxler ghosting in at the back post to help himself to the first headed goal of his budding career. 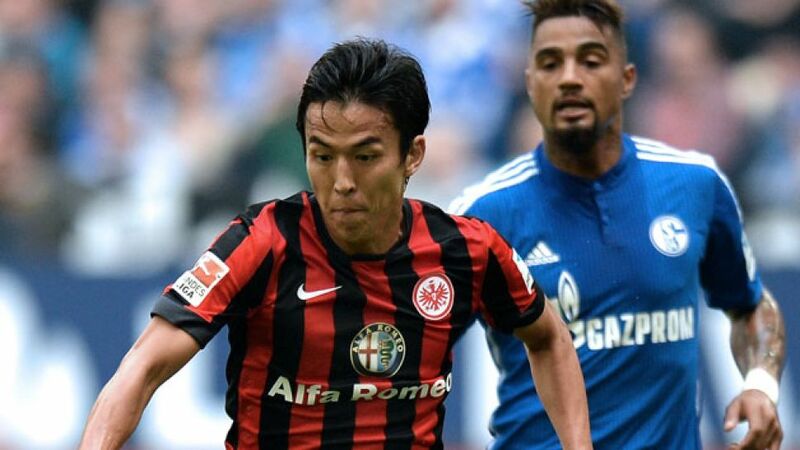 Schalke had their tails up as Boateng went within a whisker of tucking away Meyer's cross, before picking up his second yellow card of the afternoon after clipping the heels of Japanese international Makoto Hasebe. Aleksandar Ignjovski fired against the foot of the post, but it got worse still for the ten-man Knappen in the 71st minute when Draxler received a straight red card after leaving a foot in on Carlos Zambrano. At least one more twist in the barnstorming tale seemed inevitable and after Meier smashed a fierce free kick wide of the post, Frankfurt debutant Medojevic served up yet another talking point following his sending off for a second bookable offence. Chandler chanced his arm as the referee indicated four minutes' added time, but Fährmann was equal to the task.